Our Chinatown food court obsession continues with the mysterious Chinese joint in the corner with no name at Eating World. Every Chinatown food court needs a stall that has no name. At Eating World it's the Chinese joint in the corner between Gumshara and the other Japanese joint. "Is Hong Kong style!" the tops smiley lady proudly tells us. Steamed chicken - $7.80. Comes with soup (chicken and sweet corn) and rice. This turned out to be a huge lunch. The chook is moist, plain and comforting. It also comes with a good serve of veggies and and nice sauce of soy, ginger and shallots. If they didn't add that bit of oil to the sauce this would be a super healthy lunch. It's a huge amount of food for $7.80. Szechuan chili chicken - $9.50. Shawn foolishly ignores the three chili warning on the menu and orders this for lunch. Dangnabbit it's hot. There's a healthy dose of tongue numbing szechuan pepper corns plus the chook seems to be cooked in some kind of chili\curry paste. Shawn can handle a fair bit of chili but this beat him. A huge serve too. Deep fried bean curd vegetable - $8.50. Hunks of fried tofu with veg in a thick, gloopy sauce. Simple and tasty. Eggplant with salt fish and pork - $9. Eggplant is always good. Eggplant with minced pork is even better. With the occasional kick of salted fish it's divine. This dish had no English name, it's on a sign on top of the counter, but we can tell you it cost $8.50. We've noticed a lot of Chinese folks tucking into this dish with great gusto, so we had to give it a whirl. 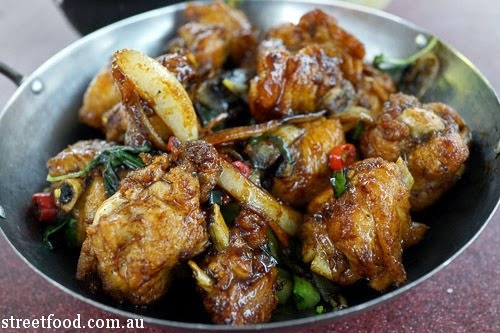 We think it is pigs feet, braised in a slightly sweet soy based sauce with strong flavours of star anise. Rustic and yum. There's lots of pork skin and fatty bits involved in this bit of the piggy, it's for serious lovers of swine. #55 XO Stir fry with pork - $9. This dish was wonderful. The green things are garlic shoots, the thicker part of the garlic shoot, they are like green beans but a little sweeter. The sweet freshness of the garlic shoots is cut perfectly by the nibbles of salty pork. Hightly recommended. #59 Three cup chicken with basil - $9.50. Chook on the bone (or off if you wish) stir fried in a classic mix of equal parts sesame oil, soy sauce and Chinese rice wine. The fresh basil gives the sauce a real lift. Awesome. You're usually onto a good thing when you know it's a regular haunt for students. I'd love to give the deep fried bean curd vegetable a go. You're so brave to order off a picture alone! Hehe - we're always in for a mystery punt! I love me a place with no name. Adds to the intrigue of it all. It also feels very communist... stall 3 of foodcourt 4. Is this the same stall that blew up last year shutting eating world down for a couple of months? I didn't know one of them blew up, must look into it... thanks! I asked the lady what the stall was called today, she said it was called Hong Kong Kitchen.